Oh Lordy, Lordy… I won’t go on about how the DVD cover is not representative of the film (though I could go on about how much better the film might have been if it resembled the cover). I won’t go on about the title being pretty much at odds with the actual film – though the original title of the Irish Vampire goes West wasn’t much better. No. Instead I will go on to ask whether filmmakers think the public are terminally stupid or whether they actually believe the crap they write. A little brutal? Not when you read the three (at time of this review) user reviews on IMDb (and the similar reviews on Amazon). Now, I fully accept that everyone has different tastes but the three 10 point reviews on IMDb are clearly by people associated with the film and no one with an ounce of honesty could give it 10 points – no matter how generous. The reviews liken it to The Cabinet of Dr Caligari, or suggest it contains the magic of poetry or that it is a film of humour and mystery. The filmmakers are either seriously deluded or dishonest as they sell this. My thoughts are drawn to Ed Wood but the charm of his films were in the fact that he genuinely believed in them. I hope that it is the case with this despite the distinct lack of charm. What is it about. A legend informs us, “When Dr. O’Nosital (Vincent Coppola), a scientist who had dedicated his life to destroying vampires, accidentally developed a serum that would allow the Vampire to walk the day and rule the world, the Vampire decided to take the doctor’s most precious gifts… his daughters, to use as leverage for the serum. And so Vanquo (Chris Payne Gilbert, Pearblossom & Moonlight), Irish Vampire, poet-sucking artist sucking Creature of the night, travelled in the cloak of darkness to America.” The first meeting we have with Dr. O’Nosital tells us much of what we need to know about the film; it is a god-awful moment of film-making best forgotten. Vanquo goes to America and gate crashes a dinner party hosted by sisters Manananaan (Philomene Long) and Mara (Pegarty Long). We are treated to the most God-awful poem about Ireland and then Manananaan is kidnapped… though we would be hard pushed to realise so as the film vanishes into its own pretentious faux-art film mode. Essentially, thereafter, Mara goes to Ireland to rescue her sister and wanders around fairly aimlessly plaintively calling Manananaan as her sister screeches Mara (she’s been turned, or half turned, or whatever).Occasionally fairies warn of vampires and generally little happens. Now, I am not being ageist but assuming this was filmed in 2007 the sisters were 67. This makes them possibly older than their on screen father and one has to wonder at the two vampires (as there is also good vampire, and brother to Vanquo, Malachi (Declan Geraghty)) who seem to romantically fall for the sisters. Of course they did, this is undoubtedly a vanity project on their part. Badly shot and badly acted – except for Chris Payne Gilbert who tries to make a silk purse from the sow’s ear of a script. There is little story (snippets of events such as the mad scientist father making a creature occur but, in that case, it is more Rocky Horror – sans comedy and genius – than Mary Shelley), little happens and I can’t really go on as there is nothing to commend this film. 1 out of 10 is a much more honest score than the reviews on IMDb but, should you want to read them the imdb page is here. I've encountered many people on Internet Forums who love Supergirl and think it's one of the best movies ever made. As bizarre as it may seems, I find completely plausible people might genuinely like a film like this that much. Hi! Thank you so much for this blog, though I see I've found it a few years "late." Thank you primarily because I am the art critic second from the right in the "dinner party" photo! I was only in that one scene but I remember VIVIDLY having to watch her read that poem over and over… that's AFTER hearing Philomene argue with her sister that this "ireland" poem "doesn't go with this painting." I also remember vividly overacting that I was drunk and looking around at the others as if to say "really? we're clapping for this?" I may actually have to spend 99 cents to watch this now…. 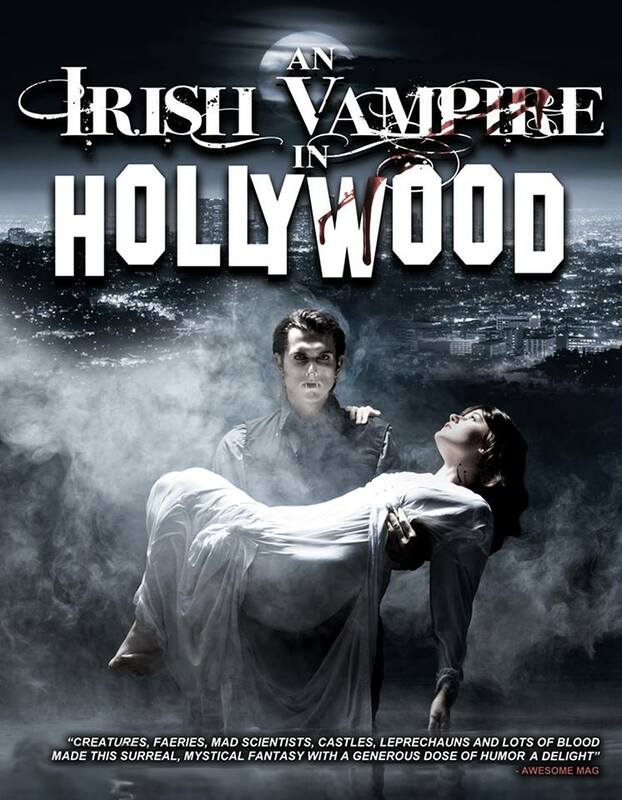 Hey, sorry you didn't like my kitchy art film, “An Irish Vampire in Hollywood “. Yeah the distributor changed the title and put a weird cover on the DVD, that didn't match the film which is more in the vein of “Nosferatu” meets “A Midsummer Night’s Dream”. Thanks for taking the time to watch my movie. I just want to chime in and thank Pegarty for her comments. I watched the film and found myself haunted by it, so much so that I had to buy a copy. Is it on my top 10 list? No, maybe not even top 50 or 100. But for some reason, I find this movie strangely enthralling and entertaining, though at times I shake my head, wondering what is going on. An interesting vision, and a nice remembrance of Pegarty's sister, Philomene.